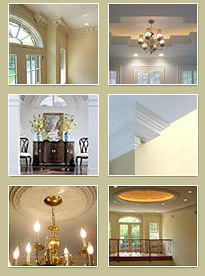 Trim Moulding is used to create added detail or to cover up gaps. They can be used as a bold design statement including corner moldings, cove moldings, rope moldings, quarter rounds, and accent moldings. Trim Moulding is the best option for making interior layout of your home perfect. It suits your home and enhances the beauty of your home interior. You can use these decorative trim moulding in the corners where walls, ceilings and floors meet. They are easy to install and are capable in giving your home a stunning look. This Trim Moulding product can also be used to hide joints, gaps, and other imperfections on surfaces. You can make many combinations of trim Moulding as per your own imagination. Combine different decorative molding products to create something uniquely yours! With Lancrest, your imagination is the only limitation. Browse through our gallery of trim Moulding and be inspired. You will soon be on your way to a beautifully decorated home.